PEARL WIN 2015 CCL CHAMPIONSHIP! Any player on any team at any level on opening day of any season will tell you the one hope he has is to have an opportunity to win the last game of the season, the championship game, in the bottom of the ninth by coming through in the clutch. For Logan Marston, the catcher for the Neptune Beach Pearl, everything he hoped for on the first day of the season came true today in the CCL Championship Game in San Luis Obispo. Marston (SF State) came up to bat in the bottom of the ninth inning with his team tied 2-2 with the Los Angeles Brewers, and, with Eric Sapp on first, he came through, launching a 3-2 pitch from the Brewers’ Scott Serigstad off the left-field wall. Sapp, who had reached first on third strike wild pitch, raced around the bases and slid safely into home just ahead of the relay throw and the Pearl were champions. It was an epic moment in a intense game filled with dramatics and, after the ensuing dogpile and celebration Marston was still buzzing with adrenaline. 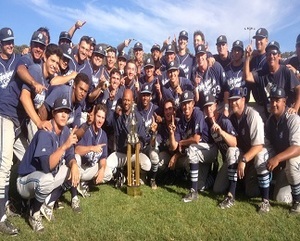 Marston’s heroic moment was the capstone to a playoff run by the Pearl filled with dramatic moments: On Saturday, in the second of the four Neptune Beach wins, Lucas Erceg (Cal) hit a ninth inning grad slam to send their game with the Conejo Oaks into extra innings and to an eventual victory; Earlier that day, JB Moss (Texas A&M) scored the winning run in another intense extra-inning victory over the San Luis Obispo Blues; And today, in the first of the two wins the Pearl needed to claim the CCL title, Stephen Smith’s (Texas Tech) two-out three-run home run in the sixth inning cemented the third win of the playoffs for the Pearl. There was even more big moments for the Pearl, and the Brewers for that matter, in the final game of the playoffs. Scoreless through six innings, the finality of the game became ever more palatable for the players when Vahn Bozoian (Concordia), the playoffs’ Most Valuable Player in spite of his team’s runner-up finish, hit a two-run home run down the left field line to give the Brewers a 2-0 lead. It was Bozoian’s second home run of the playoffs and his third and fourth RBI of the tournament. The Brewers immediately answered back in the their half of the sixth when Myles Babitt (Cal State Eastbay) walked and eventually scored on a wild pitch. In the eighth inning with two out and a runner on second, Dane Myers, who had fouled off four two-strike pitches from Serigstad, singled up the middle to plate Patrick Massoni (Austin Peay) with the tying run. Then, in the top of the ninth, Bozoian did his part again for the Brewers, leading off the inning with a double to the right field wall off of Evan Rutter (Corpus Christi) who came into the game for the ninth. But, after a sacrifice advanced Bozoian to third with one out, Rutter added yet another episode to the Pearl’s drama, battling out of the jam by inducing two weak ground balls that couldn’t advance Bozoian. The escape electrified the Pearl’s dugout and that set up Marston’s game winner three batters later. The two wins on the final day had added sweetness for Neptune Beach because the same two teams met in last season’s championship, only it was the Brewers who won twice over the Pearl to claim that trophy. 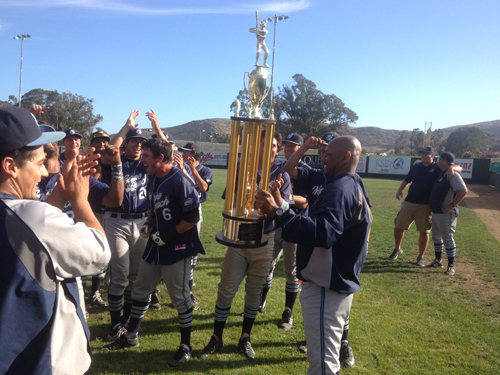 Pearl Manager Brant Cummings with the 2015 CCL Trophy.